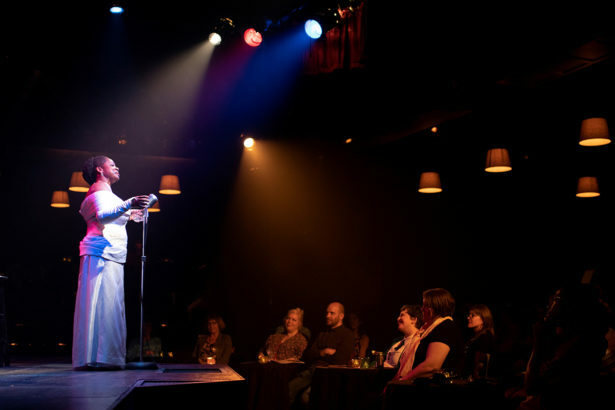 Felicia Loud is a Seattle performer, starring in ArtsWest’s production of Lady Day at Emerson’s Bar and Grill, written by Lanie Robertson and directed by Valerie Curtis-Newton. Lady Day plays in rotating repertory with Hedwig and the Angry Inch through July 8. More information and tickets here. You played Billie Holiday in Lady Day at Emerson’s Bar and Grill in 2009 with the Strawberry Theatre Workshop. What is it like coming back to this role? The newness is being older than her now, and having experiences as a mother, as an adult. The first time I performed her, I didn’t have my daughter at the time. Every time I do Lady Day, there’s some real hard circumstances that I’m going through personally. The one thing that is consistent is that every time I do Lady Day, I’m going through something in my personal life that doesn’t necessarily identify with [Billie Holiday], but identifies with the hardship of life. 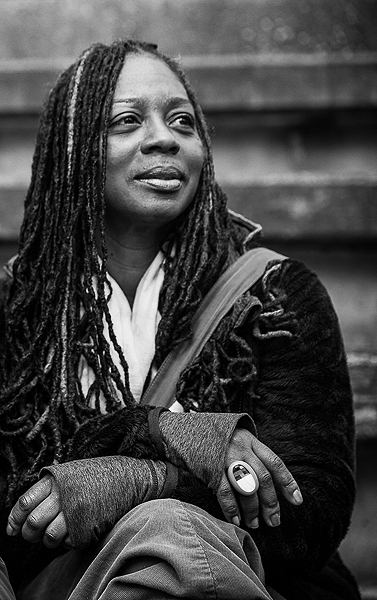 Tell us a bit about what it is like to work with director Valerie Curtis-Newton. What was it like in the rehearsal room? What was the process like? It’s great to work with her patience, her insight, her ability to meet me where I’m at and then go from there each step of the way. She’s always there with you in the moment, and ahead of you in terms of what needs to come next. The process with her has just been really comforting. Even when I’m very nervous and feel as though I’m not giving what I need to, she’s not crowding the creativity of what may come up. There’s a fluency that I feel I have. Other directors – not to make the comparison for anything negative, people have a different process of how they direct and how they act and how they are – this experience is really nice because there is this momentum. She’s like, “You’ve got to create your momentum ‘cause you’re going to be up there telling these stories.” That has to flow in a certain way – there’s certain things that she needs to see, that the audience needs to understand, in order to follow the show. But other than that she allows me to find and create. A lot of people who love Billie Holiday’s music might not be familiar with her life. Who is she to you? When I think of Billie Holiday, I think of a performer who puts all of herself into each meaning of the word, and really loves her musicians – you know, she really loves listening to them. She really enjoys them. Even in her moments of being completely high, there is something about her respecting the tone of what they give by how she moves her head, or how she moves her arm, or how she looks at them, how she closes her eyes when she’s totally into the music and what’s happening. I feel that she, like other artists and singers of that time in jazz, had the same quality – but there’s that difference in her, for me, that lag behind the music but always on time. It’s as if you didn’t have to wait for her. She would find her way to catch up, which I really appreciated because that’s something about myself that was difficult when I was younger. I didn’t understand it – musicians would be like [snaps her fingers] and I would be behind just slightly, and I didn’t get it. But it comes with personality. And I think her personality came out in her music. You’re a musician yourself with the group Black Stax. How does Billie Holiday figure in as an influence, and what other artists have influenced you – past or present? Actually, Diana Ross – when I first saw Diana Ross in Lady Day Sings the Blues, that’s what made me really want to find out more about Billie Holiday. And her influence was that – that real beauty. It was beauty. I saw Diana Ross’s beauty, then when I saw Billie Holiday I was like, she is beautiful. This is a striking woman. Her ability to stay very concrete in circumstances that otherwise could have destroyed a being. Her consistently saying she had to sing. When I was younger, when I discovered that I had a voice that was different but people would hear it – could listen to it and hear it and compliment me on it – that was the only way I really started talking. I didn’t talk too much in crowds, I was very shy. And music really did help me to come out of my shell. Other artists, shoot! [Laughs] Curtis Mayfield, Diana Ross, the Staple Singers, Otis Redding, Isley Brothers, Isaac Hayes, everybody. So many different artists. Marvin Gaye – I cannot forget Marvin Gaye. Dionne Warwick, Johnny Mathis, Gladys Knight & the Pips. 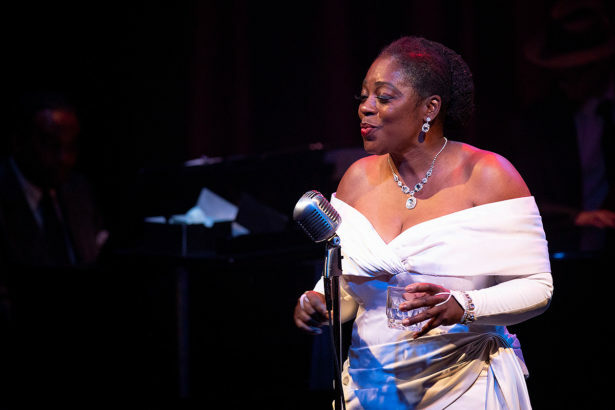 Director Valerie Curtis-Newton said that Billie Holiday’s life was fraught with all the “isms” – what it is to be black in a white person’s world, what it is to be a woman in a man’s world, what it is to be an artist in a world that doesn’t really value art. What does that dimension of Billie Holiday’s story mean to you? The stereotype for us artists is that the starving artist is a way of life. At one point in time I believe that it was. But that’s never been, for me, the way that someone that is giving of their craft should live. Anyone that is an architect should get paid for making a house, even though they may love that; a person that cooks should get paid, like a chef gets paid, for giving you the food, and farmers the same thing. But for some reason a starving artist is something to be looked at like, why would you even want it? You do this from the heart. Why would you want to get paid? And I think even in this day that the artist, still, sometimes is treated as though that’s our mission in life – just to do the art, and not ask. We should be happy with someone saying, “We’re gonna put you on a stage and we’re gonna expose you, and you’re gonna be able to be in the same room with people you wouldn’t be able to be in the same room with otherwise.” But you have to continue on with not just putting us in the same room, but the conversation has to lead to outside of the room, to outside of the state, to outside of the country, and to keep growing. I think that that even now relates because of how Billie Holiday was going into places – like she says in the play, her drinks was all they was paying her. I think that still happens today. I think that sometimes people take the artist for granted. Has that happened to you in your career? That has happened. You have to come to – I think artists have to come to a place where it’s okay to say no. You may not work with certain people for a long period of time. But you have to let people know that you’re more worthy than just being shopped around for one price – because once people get you in that one price range, they’re going to try to maintain you and keep you, and then say things like – in my case – she’s being big-headed, she’s outside of my price range, just bulls*** like that. So that has happened that I’ve said no, and the good thing is that I’ve said no enough to the point that there are some people who come to me after that negotiation and say, “Okay, give me a year ‘cause I’m still working out what I’m working out. I’m going to get the money you need and then I’m going to pay you.” Some people have just said flat out, “What do you need?” And sometimes they can’t pay me that. And that exchange is good. Bartering is a good system. But sometimes people want to get you for what they can get and they don’t want to give you anything else. It’s worked out for me. What are most excited for audiences to see in Lady Day? I’m most excited for them to see how funny, how humorous she is. ‘Cause in interviews I’ve heard, she’ll laugh at herself – even if nobody else is. She’ll find certain things funny. Some of it may be nervous laughter. Someone, maybe Carmen McRae, was talking about just how wild she was, and fun. Somebody said that she was like the “Cool Auntie”, you know, ‘cause she didn’t have any children, so it would that thing where she’s coming over and she’s loud, and she’s drunk, and she’s beautiful, and she’s gonna pick you up – you know, she’s that. So her humor onstage is really a part of what I want people to take. They know her music, they know her addiction, but her humor is something else. This entry was posted on Monday, June 18th, 2018 at 3:50 pm	and is filed under General.